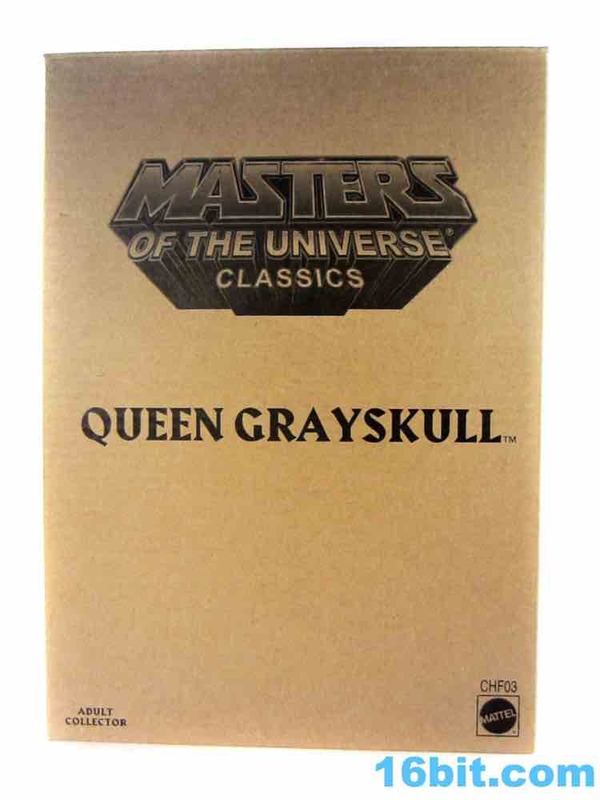 The very first figure in Masters of the Universe Classics was King Grayskull - patriarch of the 200X franchise, and the figure from which all others were descended in this line. 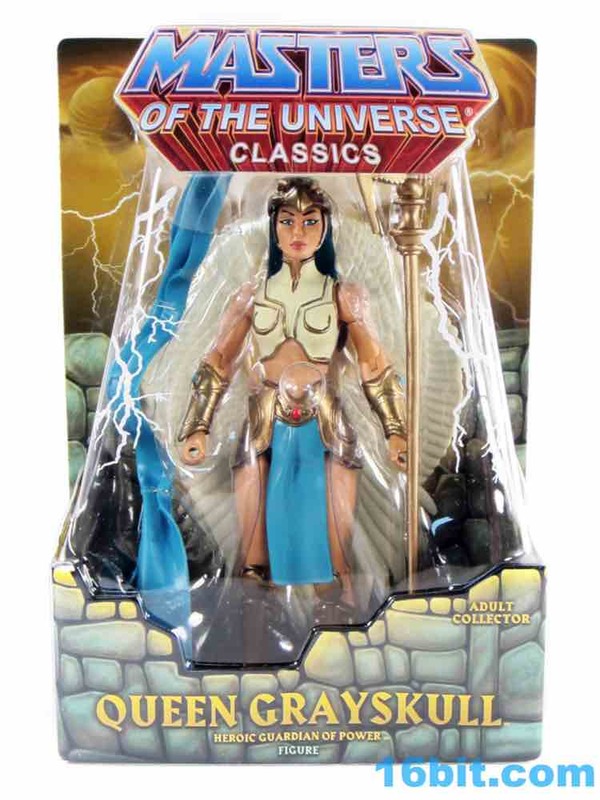 As the name may imply, he was pretty close with Queen Grayskull - who just happened to be the forerunner of the Sorceress in that cartoon series, and as such she looks a lot like the Sorceress with a more ancient bird motif. 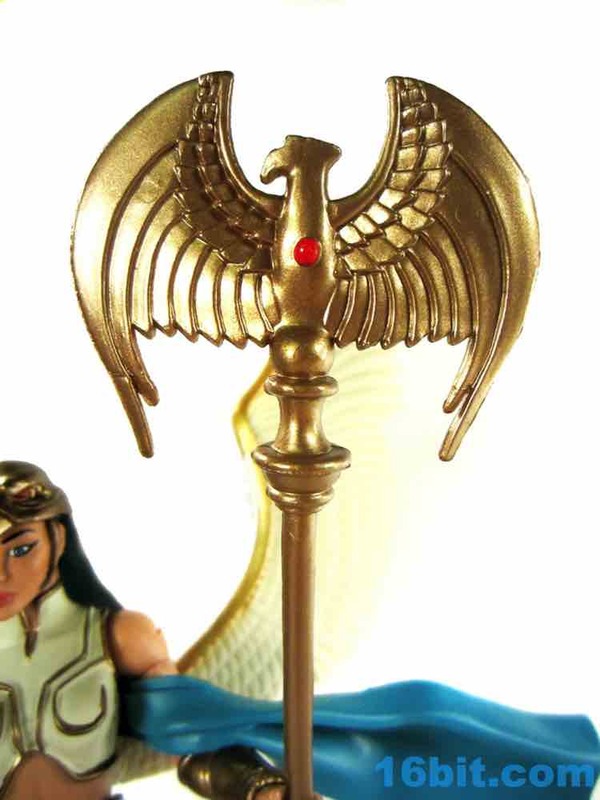 The sculpt is great, the accessories are mostly good, and there are plenty of new pieces here. 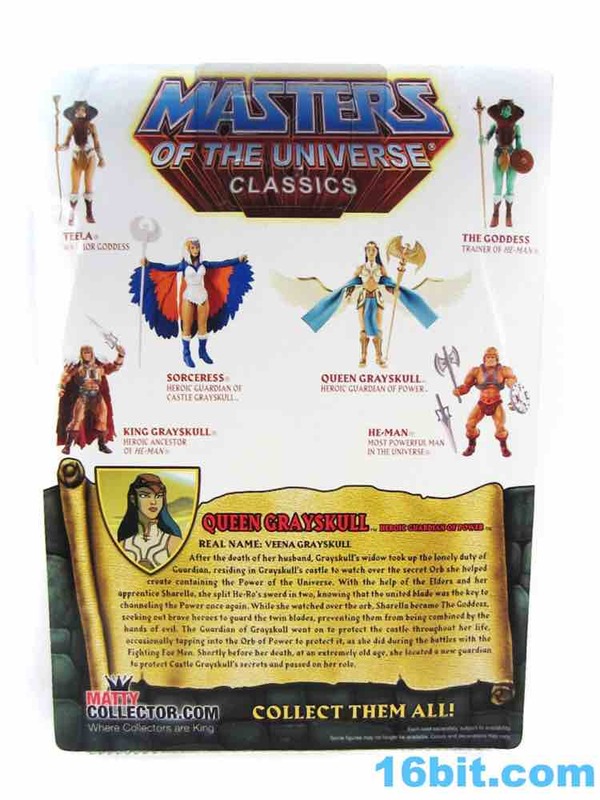 Fans desiring a full-on MOTU2K Sorceress, though, will note that Veena would need a ton of new parts to match her magical descendant. This character didn't get a lot of face time on the cartoon, but fans of any series tend to identify "important" characters - even if they have no screen time or minimal dialogue - and inflate their importance to grandiose levels. 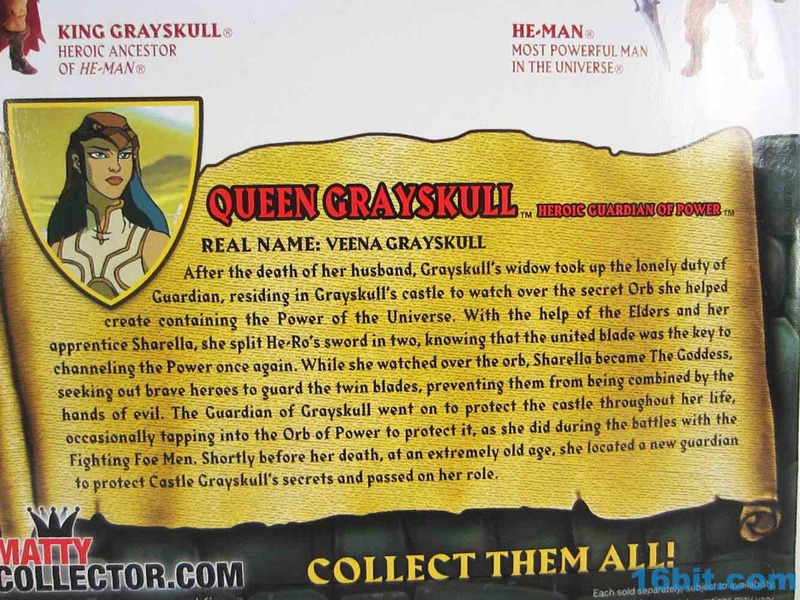 King Grayskull didn't do a heck of a lot either, and oddly, we got his lion before his lady friend. 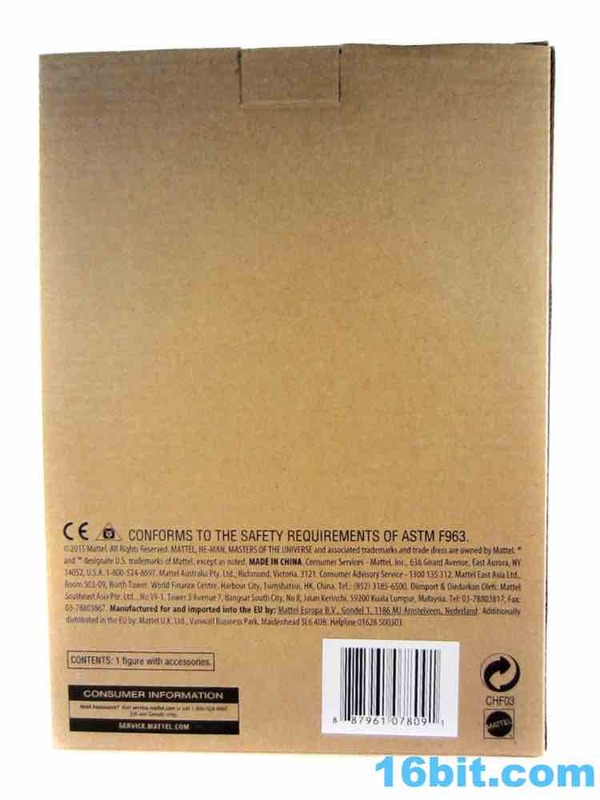 That seems kinda wrong, but such is the way of toy lines. We're pretty lucky we got Veena at all, and she sports the tone, bare-midriff, crop top look that wasn't totally uncommon on TV and music videos at the time. 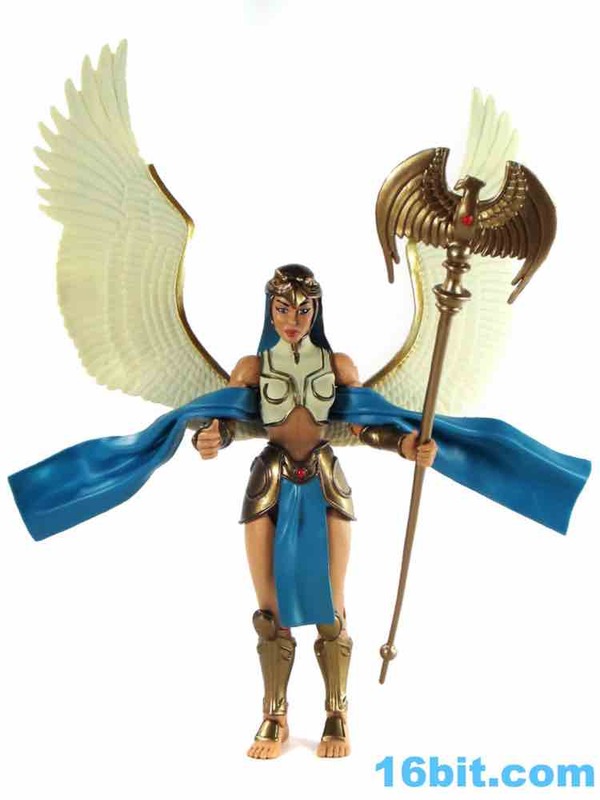 A golden "skirt" with some blue cloth and a red gem is offset by an off-white top with gold trim - and matching articulated wings. 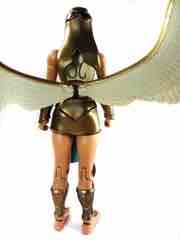 The armor on the arms is new (and awesome), the sandals are new, the greaves are new... this is a quality product. There's a reason it jumped in value considerably after launch, unlike other figures which stayed at issue price or even dropped. 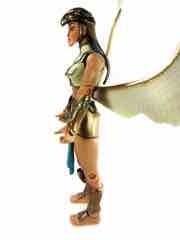 Articulation is really nothing special - if you have any other figures from the line, this is pretty close to them. 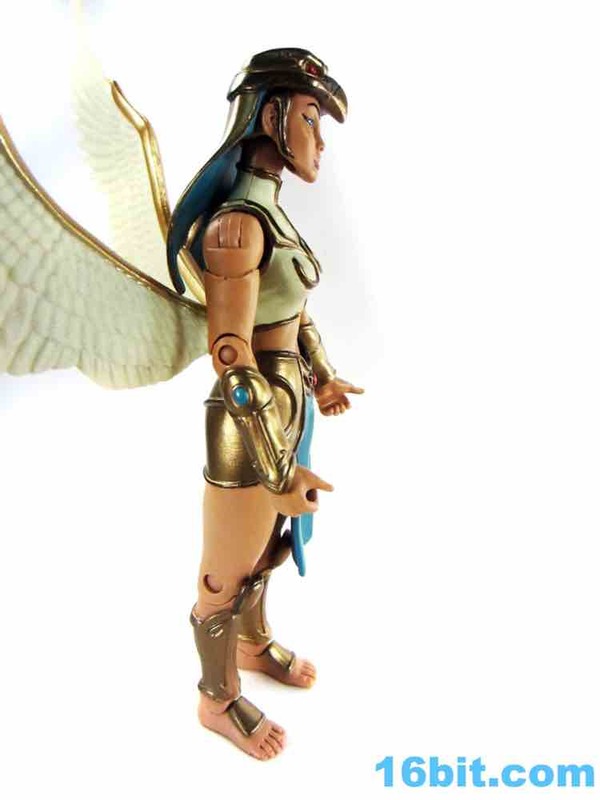 Jointed ankles and a swivel waist are nice, and the arms have the same great movement you're used to at this point. 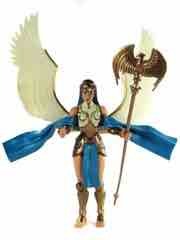 Of course, the arms are sort of held in a certain pose or two thanks to a blue shawl accessory that, well, they tried. It's not very good. It doesn't "hang" well unless you spend a lot of time bending it and twisting it so the wings hold it in place, but the sculpting is great and the color is good. I don't doubt that it was anime inspired rather than The Incredibles-inspired, notably because Pixar's film mocked capes and their deadly attributes after this particular chapter of He-Man came to a close. So it just sort of dangles there... it gets in the way if you're playing with the figure and might look better in the junk drawer. Thankfully her wings and their feathers are exquisite, the sculpted feather detail on each no doubt drove one of the Horsemen completely mad. The staff is also quite nice - chunky, old, gold. Her head sculpt is also quite nice, with decent make-up and a swell bird hat that covers her hair. 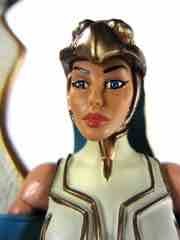 The eyes on the hat and her face are painted nicely, and painted detail is generally good all over this release. 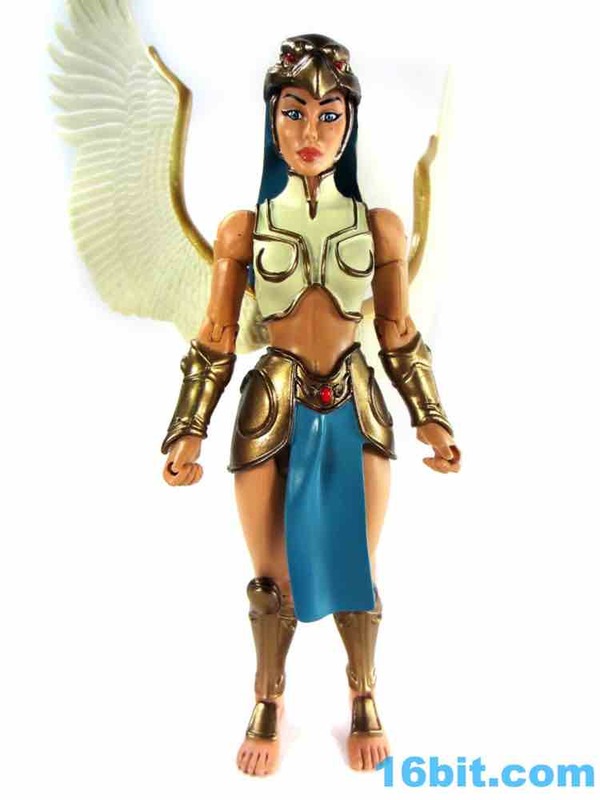 As time went on, Mattel's factory really did some nice work on these figures and for a relatively minor character she turned out well. 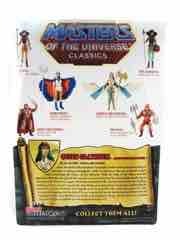 One of the nice things about Masters of the Universe Classics is that some of the figures - not all, mind you - were awesome designs and collectibles without owing a thing to their source material. 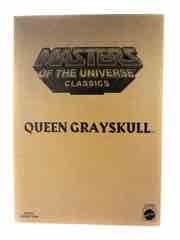 Queen Grayskull is one of them. If you handed the figure to someone with no familiarity to the material and said "Pretty cool, eh?" they would probably agree with you - minus the shawl. 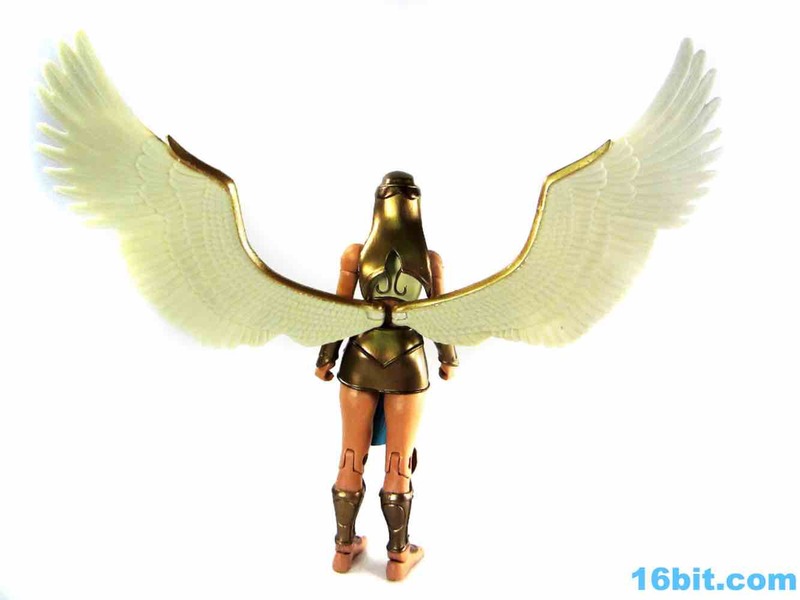 The winged warrior was done up quite nicely and is the kind of figure that would just look nice on a shelf or a desk standing guard over your pencils. 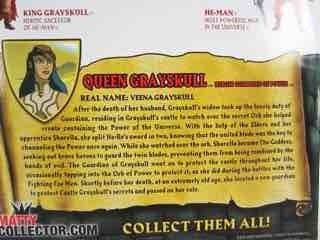 Or maybe she'll hang out in the castle which bears her name. I'd say "don't miss this one" but it appears that a) you did and b) she'll cost you if you want her. At $28 I'd say she was a solid deal - at $50, well, you could do worse. 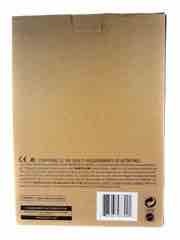 Keep an eye open on Matty Collector in case they have more to dump later, because I'd recommend this one to non-fans as well as people who stuck with the line. Nicely done, Team Matty.